Easier safety training: Instead of instructing workers to stand two feet away from a forklift, simply instruct them to stay outside the lines. Installs easily and quickly: All mounting hardware included for easy installation. Adjustable to project the safe distance to keep from the sides of any size forklift. 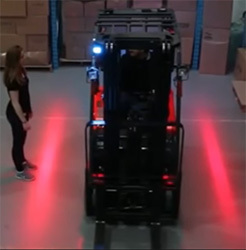 Order two lights per forklift: One light covers each side. Improve safety around forklifts and other machinery by illuminating the line pedestrians need to stay behind when approaching the sides. Research shows that pedestrians being crushed or struck by forklifts makes up 36% of all forklift accidents. The Red-Zone LED warning light helps lower the chances of workers getting hit by the rear end swing of a turning lift or their feet getting run over, as well as providing a safe zone around other equipment like scissor lifts. Installation is simple with all necessary hardware included with the light to set a safe perimeter for any size machine. Red-Zone LED warning light comes with a lifetime warranty and 100,000 hour life expectancy. The green LED lights are more visible in high light conditions compared to red lights. Show the safe zones around equipment like forklifts, cranes, and lifts with the Sideliner LED to improve pedestrian safety. The waterproof aluminum housing makes the Sideliner perfect for indoor or outdoor use. Installation is simple and easy with magnetic bracket feet as well as a 150 degree up and down adjustment angle on the mounting brackets. Use the green laser to show the line pedestrians need to stay behind when approaching the side of a forklift or other machinery in outdoor conditions. The small walnut size of the Sideliner laser is perfect for when there is not a lot of space to work with on whatever piece of equipment you may be setting a boundary for. The waterproof aluminum housing makes it suitable for outside use. Apply the green laser to many other types of machinery besides forklifts that may need a safety perimeter like cranes or lifts. Installation is simple and easy with magnetic feet as well as a 150 degree up and down adjustment angle on the mounting brackets.